As promised, it's time to talk about how to really entwine your fictional horses into your story as genuine characters in their own right. This does not mean they need to talk, act human, or be anything but what they are--equine critters with their own instincts, needs, desires, and habits. There has been a lively discussion over at Broad Universe of late, sparked by this blog, about taking fantasy horses into new territory such as making them carnivorous. That would really leave the realm of being an equine, so I am sticking here to real horses, or at least, to creatures that act like horses. Real horse characters need to act "real." Imagine that. As much as we long to be able to talk to our beasts and have them talk to us (Damn it, where does your leg really hurt?? ), that's only going to happen in fantasy, and then you had better have a really good evolutionary pattern for giving your world a horse with such abilities. Or else, really really potent magic. Every horse is an individual. Some are bold, some are timid, some aggressive, some curious. Depending on the situation, they can be all of the above. They are herd animals; they don't like being separated from other equines and will stand as close to the ones they can see as they can, even if those horses are two pastures over. They are not predators, but prey, and nature equipped them with speed to get away from danger. Thus they will jump and turn away from an unexpected threat, and often bolt in panic, or at least take two or three big jumps before the rider can regain control. This often puts said rider on the ground, entailing lots of plot mayhem. Horses need to graze constantly by nature, so they are always thinking about food. They will poop on the fly but must stop to urinate. Their hides itch when shedding winter or summer hair or after you've unsaddled, so the first thing they want to do is roll. Sometimes they won't wait for you to get off. That bridle is itchy, man! They will rub on anything to relieve that itch, including their own front leg, a post, or you. I used to hold my hand out, palm flat, to Kalup (described below) and he would do the rest. A horse's head is mostly bone, and it's hard, so a persistent and ill-mannered nag can do damage in his single-minded quest for relief. Ears: Forward is alert, back is trouble. One cocked forward means they're paying attention but not worried; both ears up can indicate eager attention (Where's the food, Mom?) or wary assessment on the way to departing at high speed. You will always see the lead horse in a group with his ears up while the rest shamble along half asleep. The one in the lead absolutely knows something around the next bend is likely to get him. He never stops paying attention. Beau here wanted very much to see what was in my hand, hoping for food, but wasn't sure it wouldn't eat him. Eyes: Horses sleep standing up but with their eyes half-lidded or shut. This is relaxation. Of course, the white-rimmed eye-rolling is obvious fear or distress, and crusted eyes indicate illness, bad dust, or something in the eye. If they don't respond when you touch them they're either deeply asleep or ill.
Lips: Beware the curled upper lip of a horse in a rotten mood. Compressed lips mean he's nursing a bad day or a grudge, and when he's angry that lip literally curls in defiance. It's very sensitive to smell, so you will often see foals and stallions with their head up and their lip curled up, smelling other horses. And if you rub a horse's belly or scratch hard at his withers or neck, he will curl his lip out in vast pleasure. Legs: A horse standing "hip-shot" resting a hind foot is very relaxed, bored, and likely asleep. If his hind legs are tucked far under his body, call the vet; he's hurting either in his back, his belly, or his hooves. If he's holding a front foot up, something hurts. The trick is finding out whether it's the hoof or the leg. Stance: A horse that won't look at you is one that doesn't trust you or doesn't want to work. If he turns his hindquarters to you, he really doesn't want to be bothered. Watch out. Tail: A whipping tail is evidence of a horse under duress. It reflects his every mood, from lazy switching at flies to "wringing" his tail, an intense shivering reflecting his resistance to what he's being asked to do. As with reading human body language, the writer can incorporate all of this onto the horses in the story to indicate one that is about to blow up, a friendly creature, or one in pain who must be taken care of before the group can get on with the day. Vixen: The mare I grew up on was a full-blooded Saddlebred. I watched her being born and owned her until she died. She was sensitive and stubborn and oh-so-loyal. She put a foot through a wire fence and cut it badly, yet, when turned out to heal up, she hobbled in on my heels from the pasture when I walked out to catch another horse to ride. She was game for anything I asked her to do, but she was so excitable that she once ran me into a post and removed most of the skin on my upper arm for me. She would completely ignore me if I went out and sat in the corral (her half-sister Lightfoot, on the other hand, would come shove her head in my lap in sympathy if I was in tears at the moment). Yet when I went out to sketch her anatomy from life, Vixen came and stood over me. I have incredible close-ups of her front legs. Kalup: Vixen's firstborn son. Oh. My. God. He is still a legend among everyone who knew him. This picture is him to the life (He's the one in the background behind the fence, fiddling with a string and unhappy because he's been blocked from where he wants to go. The mare is Vixen, the colt in the foreground Kalup's full brother.) He got up off the ground when he was born, got his wobbly legs under him, and immediately struck at my mother who was trying to take his picture. He wasn't frightened; he was showing her who was boss. An alpha male to the max, he did not even have to lay his ears back at other horses to have them kowtow to him on sight. It was the most amazing thing to watch loose horses charge up to challenge the newcomer, get to about 20 feet away, slam on the brakes, and slowly back away, acknowledging his vast superiority. He took poorly to discipline but absolutely loved trashing everything in sight. He was a fiddler, which means he knew how to untie himself, open gates, and loved open doors. Nothing was sacred to him, and he was fearlessly competitive. A mountain horse, I taught him to jump and evented him, but he would never jump into water with elan, because he knew from long experience there would be big nasty rocks under the surface. Geez, he was a pain, but oh, man, he was a great horse. Beau: Another Saddlebred (yes, my favorite breed). He stood 16.3 at the withers, taller than I am, so people always asked how I was going to get on him. Fortunately, I'm really limber and just stepped up. Also fortunately, he had wonderful manners and just stood there. He was gorgeous and gentle but had lots of life, loved kids and would go anywhere you asked him to go. He would stand with perfect patience while wee ones wandered between his legs, but get between him and his food and he got quite pushy. When he got hungry enough, he would calmly dismantle the fence and head for the hay pile. And unlike Mr. I Am God Kalup, Beau instantly made friends with every horse in sight. They never laid their ears back at him; he would reach over (or down) and nibble on their mane, and I never saw even a crabby one object to him. Horses read body language very, very well, both yours and that of other equines. Gypsy: My sister's horse when were kids was a 14.3 grade (no particular breed) mare with one interesting quirk: she hated cows. That was a born cowhorse. All my sister had to do was point her at our cows and Gypsy would lay her ears back and instantly give chase, expertly cutting them out on her own. 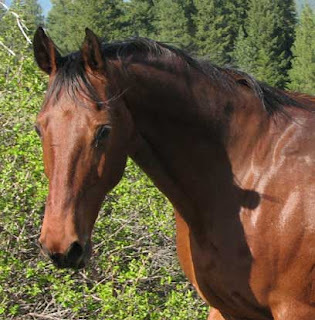 Nellie: My Thoroughbred mare is a sweet and gentle creature--on the ground. She spent years in a brood mare pasture before I bought her, among 100 other mares, so she had never been alone. She was and is the most herdbound creature I've ever owned, though vastly better than when I bought her. She panics if left alone, and the first two days in my corral she pined so intensely for her old owner I wanted to cry. She would perk up when I walked out to pet her, see who it was, and instantly droop and look away. I am "hers" now, and she's happy again, but wow. Being sold is a traumatic experience even for a horse if they have been long in a certain place, with familiar people. Once again, I could run on for days, but hopefully this gives a little foundation for fleshing out your horsey "characters" without making them human. They're not, and they're always going to act like horses, even if they can talk. It's instinct, and you can't take that out and still have a horse. Do check out my novel Firedancer if you get the chance. All content and pictures on this site copyright 2011 S. A. Bolich. Please use by permission only. Sharing this with my horse oriented friends. You should parlay these posts into a "horses for writers" book. I think there would be a lot of interest. Michalea, funny you should say that. A friend and I actually did begin such a book years ago, entitled "The Horse Book for Writers and Readers". We have not moved it forward. Maybe we should! Another thing I've seen writers do is grossly exaggerate the horses their characters are riding (in non-fantasy). It's always an 18-hand-high Thoroughbred stallion, which actually would be a pretty rare creature--and not likely to show up at a riding stable! Also, people have herd the term "wild stallion" so often that they think a "stallion" is a wild horse--of either gender. Whew! Absolutely true, Eileen. In fact, I am working on a post somewhat along those lines, about how there's just never an ugly horse in Hollywood and what you were more likely to encounter historically. I had forgotten about the "wild stallion" schtick but you're so right. It's so funny to see that lip going, and oh, yes, the tail! Kalup actually got his name from an old Pennsylvania Dutch saying: "Head up, tail up, Kalup" (though I've also heard it Halup). Prancy, prancy, that was him, strut, strut strut with that tail up, which had a beautiful natural carriage anyway because he was a Saddlebred. One thing I didn't mention is the horse talking to you and all the ways they can communicate, from snorting down that long nose to eager "huh huh huh" at feeding time to angry squalling and deafening nickers. It's so fun to hear from other horse people!